The cool silver of this Formula 1 piece contrasts beautifully with the black ceramic face plate. Luxury items, especially high-end accessories, tend to rely upon minimalism to make a bold statement in modern fashion. It is with pleasure that I can say that the new Tag Heuer Formula 1 CAH1210.BA0862 is an expression of quality and style that does not forsake the little details that truly defines the difference between the average, dime-store watch, and a name brand like Tag Heuer. 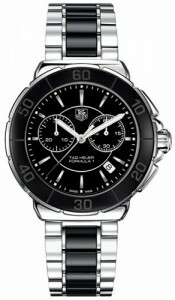 This new unisex watch from the Tag Heuer series, Formula 1, is a handsome balance between the stark onyx and silver stripes that dominate the timepiece’s motif. With the clock face made from black ceramic and the hands and dial markers from polished, luminous steel, every minute is pronounced and elegant. Easy to read numerical symbols ring the watch to help its user decipher the time. The watch hands glow for nighttime use and the large face makes no secret of whether your clock is indicating the time is three or four. A black stripe of steel runs through the adjustable watch band and an easy deployment latch serves to comfortably clasp your wrist and keep this large accessory from slipping. As a Tag Heuer product, it is equipped with a three year warranty and promises to be water resistant up to 660 feet and with its cover of sapphire-crystal, is also unscratchable and non-reflective. The CAH1210.BA0862 can compliment a man or woman’s outfit with ease. It monochromatic colors assure that matching with even the most colorful wardrobe will be a simple task. Most businesses will offer a free wrist fitting for this model. It also features a chronograph and a lap timer for precision down to the last second. There is a generous lifetime-replacement guarantee for this model and others in the Formula 1 line. Like all luxury accessories, price can be an obstacle. The CAH1210.BA0862 is no exception to this rule. The starting price is $1,900 and depending on where you shop, some online stores will have sale prices as low as $1,200, but in the end, it will still be a large chunk of any consumer’s spare cash. For that reason, I urge buyers to regard the decision to purchase this product carefully. Unlike many other fashionable brands of watch like Gucci or Michele, the Formula 1 has no diamonds, no precious stones. The value of it is purely in its craftsmanship. If that is not enough to convince you to purchase the CAH1210.BA0862, then look elsewhere. Decidedly for the consumer that has some extra cash on hand, consider this Tag Heuer if you are in the market for a watch with style, color coordination, and a handsome warranty.